I have been thinking about the approach different performers take when creating a new solo show. You can put on some music and begin to move organically. Pick up and begin to play around with props. Stream-of-conscious journaling. There are lots of ways to generate ideas. But what about once the seed of idea is in your brain. How do you mold the initial idea into a structured solo show? You have to bring the audience along with you. That means there has to be some place to start and then someplace to go in the piece you are creating. This means there is at least some kind of structure. Structure is just a fancy way of emphasizing that there is an order of events, a beginning, middle and end... even if you don't put them in that particular order. 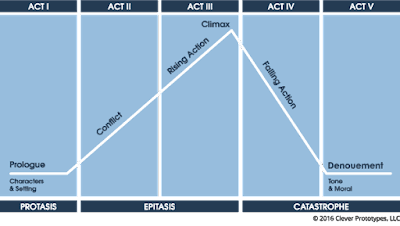 Many plays have been written based on a three or five act structure. In 350 BCE, ancient Greek philosopher Aristotle, in his collection of lecture notes on the theatre, The Poetics, cited three parts of a play (he was specifically referring to tragedy, but in broad terms it applies pretty much across the board.). These three parts are protasis, which is the introduction; the middle or epitasis which contains the crisis point and the catastrophe, which has the resolution to the conflict. In the 1860s, Gustav Freytag, a German novelist and critic, observed the similarity of plots in many stories so he created a sort of pictorial graph to visually illustrate dramatic structure. 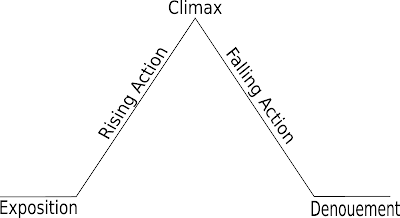 Called Freytag’s Triangle (you'll also see it called Freytag's Pyramid), he constructed a pattern in the form of an ascending and descending spike to analyze the plot structure of dramas. We use the terminology Freytag came up with nowadays when we talk about dramatic structure. Freytag’s Pyramid is a modification of Aristotle’s structure where he transformed the basic three parts into five by adding two other levels. At the beginning he put a level he referred to as exposition, rising action, climax, falling action and then the resolution. The exposition/introduction presents the setting (time and place), main characters (protagonist – hero/heroine, antagonist – villain), and establishes the mood or atmosphere of the world of the story before the plot kicks into gear. This is often called the status quo. This first part enables the reader to know more about the circumstances and the relationship of the characters with each other. We are often told of events that happened before the play started that are relevant to the story (think the death of Hamlet's dad. It happens before the play, but is hugely important to the plot). These events that affect the story that happened prior are called exposition. This is usually sprinkled in as information through the beginning of the play. Sometimes, there is a scene or a monologue that serves up a bunch of exposition called a prologue. The introduction ends when an exciting event happens leading to the conflict which impels the story to move forward. Rising action is the second part where the basic conflict has been presented and the audience is beginning to feel the rising tension associated with this conflict. At this point, the basic conflict is further complicated by the introduction of obstacles frustrating the protagonist and other characters from easily reaching their objectives. The climax is the big turning point and this third part effects a change either for the better or for the worse in the protagonist’s situation. In a comedy, the protagonist positively faces his obstacles and there is a great chance that things will turn out well; but in a tragedy, the conflict of the protagonist is worsening which will ultimately turn disastrous for him. 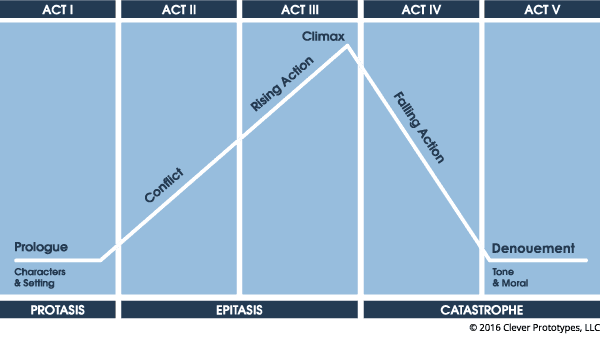 It should be noted, unlike in contemporary movies (usually with three act structures), the climax in Freytag's five -act arc takes place over an entire act, not a quick scene. A reversal happens in this fourth part where the conflict between the protagonist and the antagonist is beginning to resolve. The protagonist either wins or loses to the antagonist by this point. There are usually a brief series of unexpected incidents which make the final outcome a bit more suspenseful. 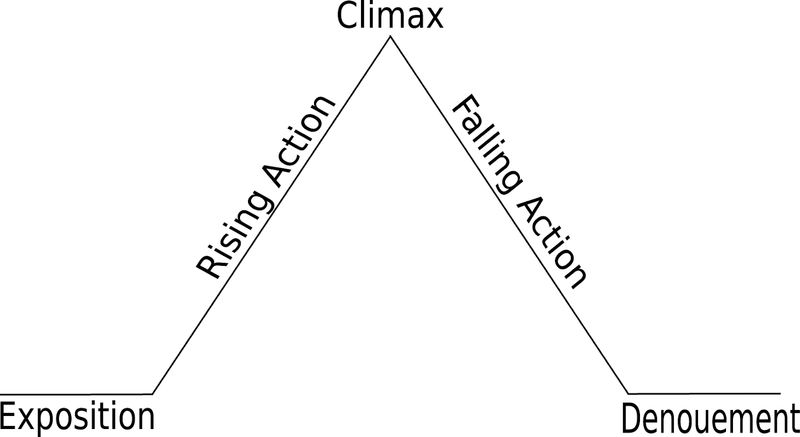 The falling action designates the story is heading towards its conclusion. The conclusion is the end of the story which is sometimes called dénouement or resolution. After conflicts are resolved, the characters resume their normal lives. The dénouement is a French word for untangling. The conclusion is explained and there is a metaphorical untying of the plot complexities. There is no rule that says you have to follow a traditional three or five act structure when you are putting together your show. And even if you do, you can play around with parts of the structure. Sometimes, especially in contemporary works, the ending comes very abruptly or there is purposely an open-ended conclusion that does not bring the story to a terminal finale. I have seen many plays structured as a series of unrelated episodes that are kind of tied together themetically. I have seen a sort of Gestalt structure with seemingly disparate scenes that build on top of each other to leave the audience with a sort of over-all cumulative impression by the end. I have even seen a piece structured like a metaphorical Russian nesting doll where the protagonist in the story encountered a hydra of new problems every time he overcame the next step in the tale. He was comically pushed further and further from accomplishing his orginal goal until he just gave up and stopped. I remember another show where the plot wound around on itself cyclically like a snake eating its own tail and he ended up at the conclusion right back where it had started. Though you are free to structure the order of events in your piece however you like, audiences nowadays are pretty sophisticated. With the complex television shows, variety of movies and constant stimulus of the internet today's theatre audiences are often rather savvy when it comes to understanding story, especially on an instinctual level. Audiences can sense if you are skipping over important sections, or will rightfully be angered if you indicate that the story is leading up to a terminal ending and you don't deliver. Audiences have been conditioned to listen and pick up on hints, symbols, tone and so on. More important that a traditional structure is a sense of completeness in your show. Tell what needs to be told. The order you putting that telling in is called structure. "Everyone carries a room about inside him“, Franz Kafka wrote in his diary in 1916. Today, over a century later, we are delighted to be able to unlock the doors to a few such rooms for the eleventh time. All of them are different: more or less comfortable, lonely, captive, hopeful, forgotten, loving, desperate, waiting, consoling, playful or fighting. Already the first room is rather extraordinary – it belongs to Karl Rossmann, Kafka's fortune seeker, portrayed by Philipp Hochmair whom we welcome at Thespis for the second time. Monodrama is as alive and diverse as never before – and all that a world which threatens to become smaller and narrower. 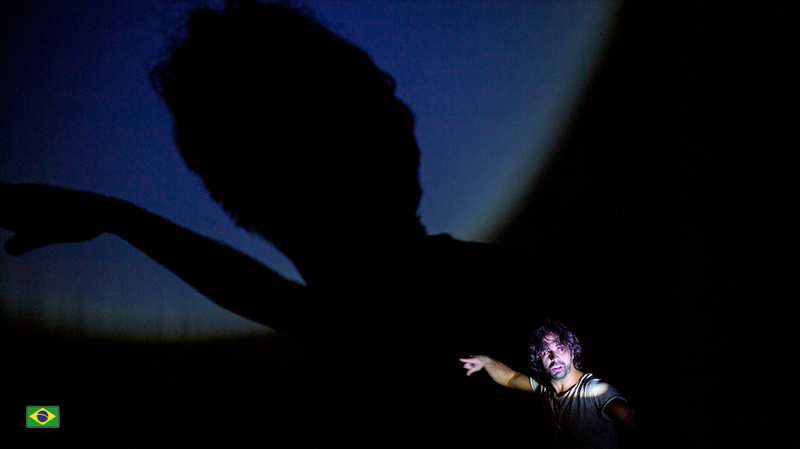 Solo performance is most probably the theater form of the hour to tackle isolation and egoism. It challenges us to take our time for the outrageous stories that one single life, often remote from our own, can write. And to cast one's gaze into a room that appears so alien and so very far from ours… We hope to have piqued your curiosity and look forward to your visit to the 11th edition of THESPIS. 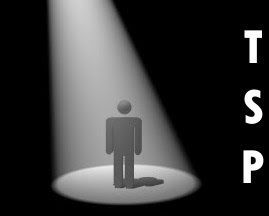 7 CONSIDERATIONS FOR THE SOLO PERFORMER resource for FREE! Minion Production's own Grant Knutson answers some questions on how touring Fringe performers can market their shows and get butts in seats. Hey there, if you know of someone or some festival/event that should be covered here on TSP, drop us a line. Thanks. Back in 2015, we linked to an article about solo performer Siobhan O'Loughlin and her site-specific show Broken Bones Bathtub. “The audience’s knees are up against the tub, where I’m naked, covered only with bubbles. And they’re giving me a bath. They’re washing my hair. As I shared my stories, people began to share their stories. It turned into this hour-long immersive experience,” she says, laughing again at the pun, which is excellent and completely inescapable. I have been in a Spalding Gray mood lately. Found this great interview from 1997. I am making my way through the Masterclass series, where filmmakers, dramatists, actors, architects, cooks and writers share their stories and techniques. 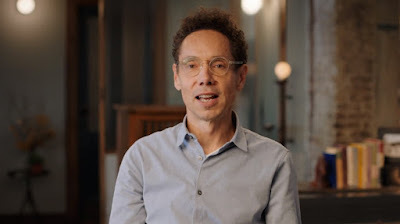 I was listening to Malcolm Gladwell discuss writing in one "Masterclass" and he said something that may be beneficial to creating solo shows. He was discussing this idea of "the imperfect puzzle" and illustrating that sometimes a narrative is intersting if the pieces "don't all fit together perfectly." He used as an example an article he was reading written by a British researcher in the 1970s. The researcher was tasked with investigating juvenile delinquents around the United Kingdom. What the researcher found was that there were schools where students always ran away, and schools where no students ran away. The researcher hypothesized that deliquency had something to do with the schools themselves not the students. The article, however, ends with no conclusions. The researcher states he was called to research some other subject and never found out what exactly was causing juvenile delinquecy around England. Gladwell cites this as an example of an open-ended puzzle. The reader doesn't get a perfect argument with an obvious conclusive answer. Instead the article is memorable and caused Gladwell to ruminate, not jut with a kind of WTF? mentality, but to reflect, himself, on what could have been causing the juvenile delinquency. This may be something to bear in mind when creating a solo show. Does your character need to answer every question that arises? Solve every dilemma? Could it be more dynamic, more memorable, more intriguing by leaving certain summations out?